One of my all time favorite songs is only 1m52s long – that’s not much for a song, but it doesn’t stop it from being beautiful. These lemon pots are made in no time at all and are delicious – it took me a little longer than the song to put them together; they developed a wonderful velvety texture after resting in the fridge. I’m finally on vacation now - see you in three weeks! Place cream and sugar in a saucepan over medium heat and stir to dissolve the sugar. Bring to the boil and cook for 3 minutes. Remove from heat, add lemon zest and juice and stir to combine. Set aside for 5 minutes to cool slightly. Pour into four ¾-cup (180ml) capacity dishes and refrigerate for 3-4 hours or until set. Top pots with the whipped cream and serve. i officially have no excuse NOT to make these! they look delicious and totally do-able, even in my lame little college kitchen! Those look so yummy and luxurious! Have a great vacation! Yum! I want these now!! They look really great! Ahah! We were exactly on the same frame of mind with lemon pots de creme!! They are gorgeous Patricia! 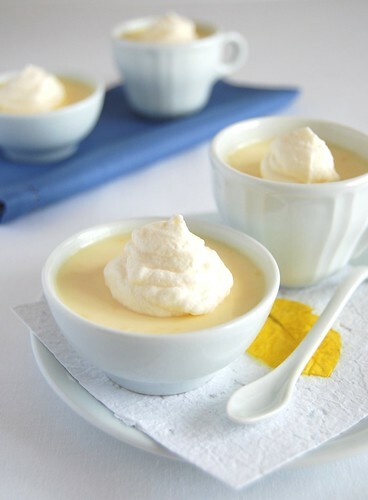 These delightful desserts look similar to a lemon posset. I think it is almost like kitchen alchemy!!! Oh, my do these look good! I love lemon, and creamy things and little pots. Guess what I'm making tonight? so so so beautiful! not to mention, lemony desserts are always my favs! Lovely. I can rarely resist lemon desserts, and this is no exception! Lovely, elegant little lemon pots--how divine! Hope you're having a delicious vacation, Patricia. That looks amazing, Patricia! I love anything lemony. And the praline whipped icing on your previous post looks great too. Tagging this - looks easy and delicious. So simple!! So delicious!! Lovely pics!! 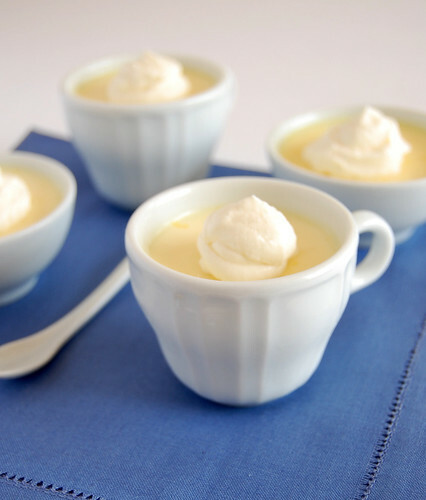 I adore lemon pots de creme. They are so lovely, Patricia. And yay! on the Saveur mention. It's well deserved. Ok, not only are those super cute, they sound delightful! I love lemon desserts like this ... creamy and refreshing. I've made a chocolate version of this a million times. I will have to make this now. I bet it would be lovely in lime too!! These are so beautiful! I love lemon cream like this, but I've never made it at home. I guess it's time to try! I love the idea of a crust-less lemon pie. Perfectly, beautiful gluten-free and my favourite kind of tangy. These look beautiful and sound so refreshing, Patricia. And congratulations on having your soup on the Saveur website--very cool! This dessert looks fabulous! Enjoy your vacation, and congrats on being featured on Saveur. That's awesome. Your cupcakes look good, too! This looks so perfect in the little tea cups! These look so delicate and pretty! Lovely shots and they look amazingly delicious. Oh yum yum...I think I've seen little somethings like these in INDULGE by Claire Clarke too. i'm ready to dive right in!! Ooooooops, manners! Hope you have a great vacation! Have a great time, Patricia! :) Congratulations on the Saveur feature! You can never have too many lemon recipes! These look so nice and dainty. nice stuff. love to try them. These look delicious! I love lemons, and have a tree full of them at the moment :o) Have a great vacation. Lizzie, I'm sure you'll love these! Kate, I hope you like it! Jane, thank you very much, darling! Xiaolu, tks for stopping by! The Red Deer, thank you! Kelly, using limes sounds like a wonderful idea! Frugal Kiwi, I hadn't thought of it as a gluten free dessert. Great! Terry, thank you, my friend. Deeba, go ahead and make some, darling! Mark, thank you, my friend. Sharona, I hope you like it! Dear Julia, I'm back! Thank you! I love lemon... this dessert will be on my to-do list! Oh my goodness! This looks sososososososososos wonderful! Simple, too! Patricia, I just made these and LOVED them!!! The only change I did was adding a pinch of salt to the mix, as I always do that with desserts. Leemei, hope you give it a go! Pille, that is great news! I'm so glad to hear that - thank you for letting me know!